How frequently do you ask yourself the ‘why’ question(s)? | Precious Thoughts! 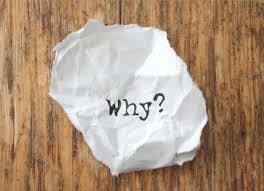 How frequently do you ask yourself the ‘why’ question(s)? There have been numerous times when I have seen married couples look like each other, most times, you find couples that have been together for quite a long time, look like siblings. There are those who are just getting married and they already look-alike, and I’m like- ‘Can someone explain how that happens?’ Like really, please explain in the comments section. I want to know why and if possible, the theory behind such a mystery. Thank you! But you see, there is this mystery that we [christians] come to terms with, as we journey with the Lord….‘And we are transfigured much like Messiah, our lives gradually becoming brighter and more beautiful as God enters our lives and we become like him.’ 2 Corinthians 3:18. At first, plain-flesh-sight, I just feel this is just plain exaggeration. It is just a standard that has been set for man to strive to, to be better, but cannot necessarily be attained. C’est faux! This is false! The words in the bible are not hypothetical theories that have been laid down to be experimented. The Word of God is life, so as it’s been said that as we truly walk with the Holy Spirit, we are to become like God- it is possible. Never forget that! Why do you give? You want to be known as that cheerful giver, who gives generously? You want to give so that you can get something bigger back?…..
Why do you go for that mid-week service? To see that brother/sister, that your heart has been crushing on, and of course, listen to Word of God? To be seen as that spiritual brother/sister who does not go to church only on Sundays?….. The ‘motive check’ questions are definitely inexhaustive. And very necessary. A daily necessity, in all that we do. It will be quite sad if we are driven by motives that are not sourced from God, because that will mean getting earthly rewards not the eternal rewards. What ever you do, and in all that you do, the motive should be for God to seen and experienced. In the little and the big. I have to add that, our motives changing is not a day’s job. It’s a process, a journey. Not at Bro. A’s pace or that of Sis. B’s. But as we strive daily to become like Christ, there is a change, a renewal of our thinking and desires. You may have read this post and may feel when it comes to the motive checks, you do not meet up. Don’t beat yourself down. God is right where you are to empower you. I cannot even say that I have arrived, I have to say that I die daily. I am not the standard, neither is any man. So, tell me [us], why are you a christian? P.S Hope you are still on track with the 60 day praise challenge ….. I asked my friends this question a while ago, why are you a Christian? because if you”re not then you belong to the devil? because you need favors from God and the only way to get it is to declare your loyalty? because it makes you look good and spiritual? because your friends are Christians and you don’t want to be left out, because its what is trending now, or because you LOVE GOD, BELIEVE HE IS, TRUST HIM COMPLETELY WITH YOUR ALL or what? 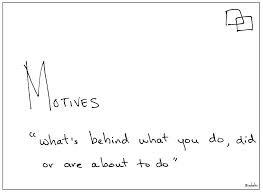 trust me, if you don’t check your motives daily, you may even believe you’re on the right track when your motives are wrong. God Help us all. I am a Christian by Gods Grace, because I believe there is a God who loves me and knew me before I came to be, I have come to love that God so much for who HE was and who HE is and who HE would be forever. I am a Christian because I trust him and I need him desperately, because I depend on him completely and because his way is the only way I choose. Wow! I have to read the second paragraph again. God bless you, hun. Why am I a Christian, hmm, I’m a Christian because I love God, because I’ve found someone who is always ready to be by my side even when those i love fail me, because I’ve found the best leader and the best head of my life. No one leads better than our creator! Thanks for reading. Pingback: GUEST EXCLUSIVE: Be Reminded that…….. | Precious Thoughts! And thanks for this Precious. Convicted in so many ways and learnt a lot in so many ways. God help us as we die daily..